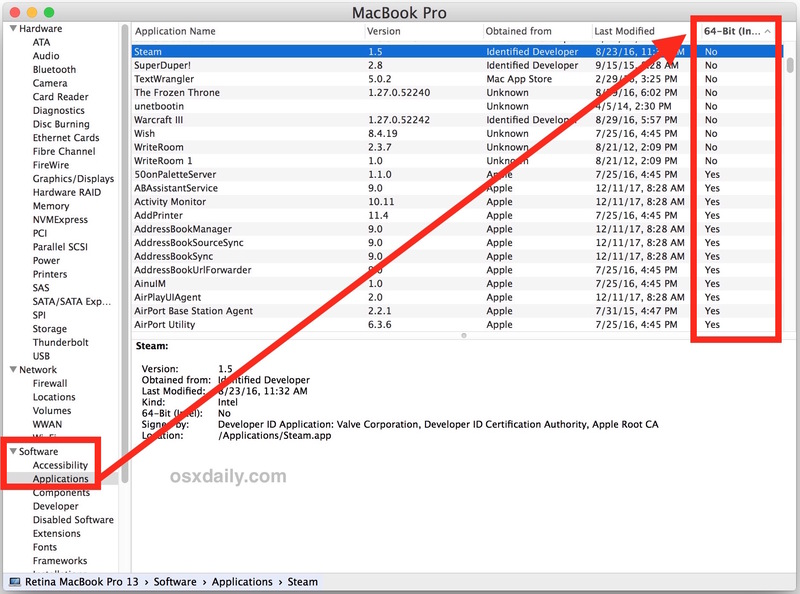 What apps are 32-bit will vary per user, but some games are often 32-bit still on Mac too. Some I am guessing will never be updated which is disappointing for down the road usage. I hope Apple does a Rosetta type experience for 32-bit for quite a while to preserve those games. I wish it were the opposite, and Apple would let users of old machines like my 2006 MacBook Pro install the latest version of OS X (macOS, now) on 32-bit-only Macs. I know that OS X took the 64-bit-only route with Lion, and I understand the though process, still, it’s a shame, really. I can’t buy a new Mac, even a Mac Mini, so I’m stuck with Snow Leopard (not a bad OS), and I can’t update/upgrade most of my apps because of this 32-bi CPU. Snow Leopard is one of the best Mac OS releases ever made, particularly 10.6.8 which is amazingly stable, has none of the iCloud background weirdness, no curious daemons and internet connections, is not a RAM hog, is very lightweight and fast, and is just great. Sure some newest apps are incompatible but if it works, it works. Try out High Sierra for a week and you’d be begging for Snow Leopard back, haha! I am only partially joking, a relative of mine has Snow Leopard on a 2009 MacBook Pro and it’s so much faster and resource conservative than my Sierra Mac. As for High Sierra, I am skipping that entirely after learning it’s too problematic to be useful for me. I will skip the next version too if it’s unimproved or worse. …truer words have never been written, although I would also add Yosemite to the top, rock solid performers. I was disappointed to find that my mac version of YNAB is 32 bit. It is no longer supported so no 64 bit version will be made. Also Collectorz MovieCollector and MusicCollector are 32 bit but they are well supported so I think they will be updated eventually. SuperDuper IS 64 bit (v. 3.14), so no worries there. Several of my 32 bit apps are issued by Apple, for example DVD Player, yet I’m running High Sierra 10.13.3? I’m pretty sure they’ll update those apps if macOS drops 32-bit support. AAM Registration Notifier; COCM_1_0_32; COPS_1_0_32; CORE_1_0_32; Device Central, several Flash Players, Install; several Setup; several Uninstalls. Any idea on what to do with them? Those are Adobe apps that you mentioned. If you click each one in the System Information under Apps, you’ll see they are Adobe products. No need to hold the alt/option key, just the usual unnecessary steps this site likes to post. Also, to simplify further, click the 64 bit column and it will sort all applications into 32 or 64 bit for easy id. Dropping 32 bit support is just one more reason for me not to upgrade my OSX. I depend on Adobe CS5.5, and wont afford to pay. So, must not upgrade past loss of 32. Personally I am staying on macOS Sierra and El Capitan until Apple sorts out their software difficulties unrelated to 32-bit and 64-bit compatibility. As for loss of 32-bit support, it will be interesting to see when that comes rather than just a warning. Maybe the next release this summer? Who knows. But, something to be aware of. I also use a lot of 32-bit apps and some of them can not be updated, or are no longer supported by the developer, so staying put is the only solution for me for running those apps. I will be interested to see what Apple uses for 32-bit compatibility in the future, and for how long they support that. But with iOS as a guideline they just stopped 32-bit completely… let’s hope it persists on Mac a lot longer than that! 64-bit Intel CPU’s run 32-bit code obviously. If Apple is removing support for 32-bit apps, it has nothing to do with your CPU. Apple is removing 32-bit API from their OS for what ever reason they see beneficial to them. Most apps don’t need 64-bit technology unless they are needing larger amounts of ram that 32-bit can not handle. I see 64-bit as a memory hog and battery killer myself. Just more scare tactics in order for you to upgrade. I get a “no information found” message? !